It's true that I'm fond of all sorts of handguns, but I have a particular fondness for little guns, especially ones that really pack a punch. 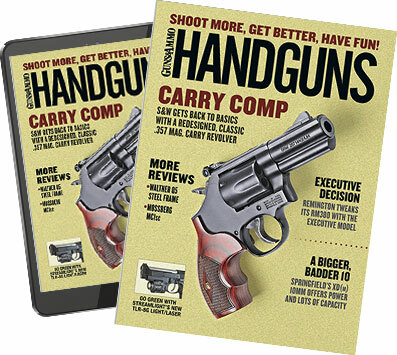 As a law enforcement officer and special agent over the last twenty something years, I've carried a variety of little handguns as backups, and occasionally for primary carry. One of my favorites has long been the Walther PPK/s, along with the Colt 1908, which is one of the most comfortable to carry handguns ever. The only trouble is both of these little autos are chambered for .380. I've never minded carrying the .380 as I believe it to be a relatively good manstopper — nothing like a .45 ACP, of course, but if the shot is place right, it'll work. I once loaned a friend my Walther to put down a 250 pound hog. One round between the hog's eyes at about a yard away did the trick. The hog dropped like a sack of potatoes and never flinched. As my late friend, retired federal agent Wilder Dresser, always reminded me, the Nazis used the .380 cartridge very effectively. Now we have the Kimber Solo, one of which I recently received to test. I was impressed with the Solo from the beginning. It's very small, beautifully made, and is chambered for the 9mm cartridge. The Solo is even more comfortable than either my Colt 1908 or the Walther as it's very thin and short. I was afraid the Solo might be a little snappy at the range, but I ran a hundred rounds or so through it without a hitch. Not only was it easy to handle, it shot extremely well. I was able to pop a steel plate at 20 yards in rapid fire mode pretty easily. I plan to spend a good deal more time with the Solo, and I'll submit a full report on it at some point in the near future.